alaTest on kerännyt ja analysoinut 203 arvostelut tuotteelle Bose Wave SoundTouch Music System IV. Keskimääräinen antama arvosana tälle tuotteelle on 4.5/5, verrattuna keskimääräiseen arvosanaan 4.1/5 kategoriassa Audiolaitteet. Me analysoimme käyttäjien ja ammattilaisten antamia arvosteluita, tuotteen ikää ja muita seikkoja. 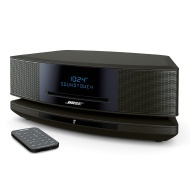 Verraten muihin tuotteisiin kategoriassa Audiolaitteet, Bose Wave SoundTouch Music System IV on saanut alaScore™-arvosanan 89/100 = Erittäin hyvä. Working with the WiFi is a little confusing. It doesn't go to different WiFi without going through the whole process again. I bought the Bose for my sister's memorial. It worked great and the sound is fantastic. The sound filled the whole room. I love my Bose radio CD player and WIFI it's awesome.It gets two thumbs up!!!! We love our Bose stereo/CD player. BOSE is an awesome product; I recommend it highly. Very pleased with our choice of purchase. We have contemplated the purchase of a music system for a year. We have favorite CD's that we want to continue enjoyment of, which lead us to BOSE rather than Sonos. The best sound system I have ever owned barring none. I purchased this Wave for my personal bedroom, and I can truly say that the radio, and music I play from CD's, and bluetooth sound phenomenal. Excellent for living room also. This is my 3rd Boise purchase and I am again very satisfied with the sound and quality!